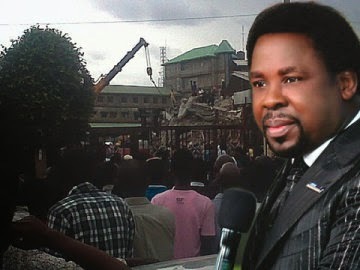 The founder and General overseer of the Synagogue Church of All Nations, Prophet T. B. Joshua has said that Boko Haram may be responsible for the collapse of a six-storey building in the church premises. Joshua, who told members of his church on Sunday not to be afraid, said the attack was targeted at him and not at them. The prophet made it clear that the collapse of the six-storey building at around 11.45am on Friday which led to the death of no fewer than 16 persons was a Boko Haram attack. Joshua buttressed his claim by showing to his congregation on the Emmanuel TV the chronology of events shortly before and after the accident as captured by the church’s CCTV. Joshua read a letter which he said was addressed to him by a Boko Haram member, confessing how he had attempted to plant a bomb inside the church. Joshua said his church was being attacked to scare away members. Assuring his congregation that God would bring the perpetrators of the attack to book, Joshua said that the decision of the insurgents to focus on his church might be the end of the Boko Haram’s activities in the country. He said,“I know you will ask why the church? It is because of the spiritual blessings that God has bestowed upon us. A big head wears a large hat. 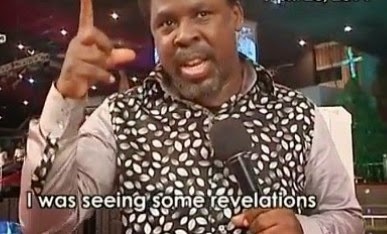 “They are trying to scare you from coming to church. Don’t be scared, you are not the target, I’m the target. I know my time has not yet come. I have not yet finished my job. Two female children, aged four and eight years, were among those rescued from the collapsed building.